Senate Intelligence Committee Republicans proposed removing the nation's largest intelligence gathering operations from the CIA and the Pentagon and putting them directly under a new national intelligence director. Sen. Pat Roberts, R-Kan., the committee chairman, unveiled on Sunday the most sweeping intelligence reorganization proposal offered by anyone since the Sept. ll commission called for major changes. In an appearance on CBS' "Face the Nation," Roberts acknowledged that full details had yet to be shared with either the White House or with Senate Democrats. "We didn't pay attention to turf or agencies or boxes" but rather to "what are the national security threats that face this country today," Roberts said of the proposals supported by eight GOP members of the intelligence committee. "I'm trying to build a consensus around something that's very different and very bold." But he immediately ran into some resistance from a Democrat on his own committee. 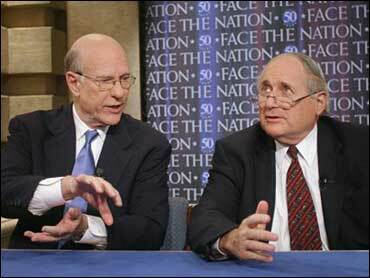 Sen. Carl Levin, D-Mich., said that before appearing with Roberts on the CBS show neither he nor the committee's ranking Democrat, Jay Rockefeller of West Virginia, had seen the full proposal. "I think it would be better to start on a bipartisan basis," Levin said. "I think it's a mistake to begin with a partisan bill no matter what is in it." Rand Beers, national security adviser to Democratic presidential candidate John Kerry, welcomed Roberts' proposal and described it as very similar to Kerry's proposals. But he added that bipartisan support would be needed as well as leadership from President Bush. "Bush still appears to be dragging his feet and resisting any real changes," Beers said. The White House was a bit more noncommittal. "We look forward to reviewing the details of Sen. Roberts' proposal," said White House spokesman Brian Besanceney. "We have taken nothing off the table." The commission that investigated the Sept. 11, 2001, terrorist attacks called for a powerful national intelligence director who could force the nation's many agencies to cooperate. Up to now the debate has focused on how much power to give that official rather than on retooling agencies. Most Democrats have supported the commission's proposal that the new director have authority over hiring and spending by the intelligence agencies. President Bush has endorsed creating the position but has not reached a final decision on what powers the office should have. Roberts said his aides had spoken with White House officials and would share the details of his proposal with them on Monday. Roberts' plan would put the CIA's three main directorates — Operations, which runs intelligence collection and covert actions; Intelligence, which analyzes intelligence reports; and Science and Technology — into three new, separate and renamed agencies, each reporting to a separate assistant national intelligence director. It also would remove three of the largest intelligence agencies from the Pentagon. Although the measure would essentially dismantle the CIA, Roberts said in a paper he released: "We are not abolishing the CIA. We are reordering and renaming its three major elements." "No one agency, no matter how distinguished its history, is more important than U.S. national security," the paper said. A congressional aide, speaking on condition of anonymity, said there would be no CIA director, and the agency's parts would have new names under a new management structure. Despite Roberts' assertion that he wouldn't abolish the CIA, some intelligence officials think that sounds exactly like what he is trying to do. Some intelligence officials think Roberts' proposal is "unworkable and could hamper the nation's intelligence efforts at a critical time," said one, who spoke on condition of anonymity because of the sensitivity of the debate. This official added that rather than eliminating barriers between agencies and bringing functions together, "it smashes them apart." Last week, acting CIA Director John McLaughlin, a career agency employee, urged Congress to move carefully and argued that there had been dramatic improvement since Sept. 11 in the sharing of information by various intelligence agencies. Equally drastic changes were proposed at the Pentagon. The nation's largest spy agency, the National Security Agency, which intercepts electronic signals around the world, and the National Geospatial-Intelligence Agency, which analyzes satellite pictures, would be removed from the Pentagon and put under direct control of an assistant national intelligence director for collection. The Defense Intelligence Agency's human intelligence collection activity would become a separate agency, like the former CIA directorate of operations. Both would report to the same assistant national intelligence director for collection. This official also would have direct line control over the FBI's counterintelligence and counterterrorism units, although they would continue to operate within the FBI administratively and would still be subject to attorney general guidelines. The Pentagon's huge National Reconnaissance Office, which operates spy satellites, would work under an assistant national intelligence director for Research, Development and Acquisition. That same assistant would also run the CIA's former directorate of science and technology as an independent agency called the Office of Technical Support. In a Senate Armed Services Committee hearing last week, Defense Secretary Donald H. Rumsfeld advised moving cautiously in restructuring the intelligence community. "If we move unwisely and get it wrong, the penalty would be great," Rumsfeld said. "We would not want to place new barriers or filters between military combatant commanders and those agencies when they perform as combat-support agencies." Perhaps mindful of that warning, Roberts' plan would create a separate assistant national intelligence director for military support and a four-star director of military intelligence who would run Defense Department tactical intelligence units and report directly to the defense secretary.